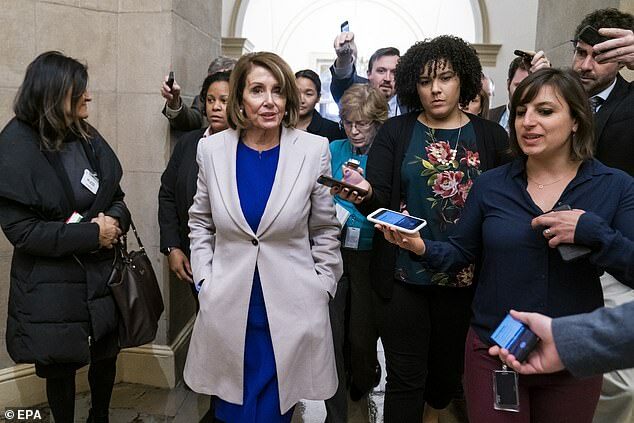 President Donald Trump has called on Congressional Democrats to make a deal on wall funding to end the partial government shutdown. 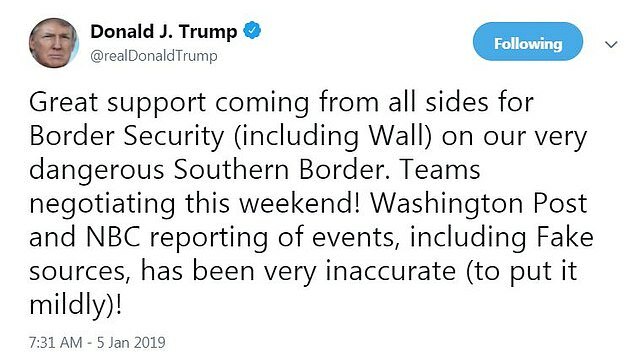 ‘I don’t care that most of the workers not getting paid are Democrats, I want to stop the Shutdown as soon as we are in agreement on Strong Border Security!,’ Trump tweeted on Saturday morning. ‘I am in the White House ready to go, where are the Dems?’ he continued, about an hour before a planned meeting between top administration officials and Democrats. 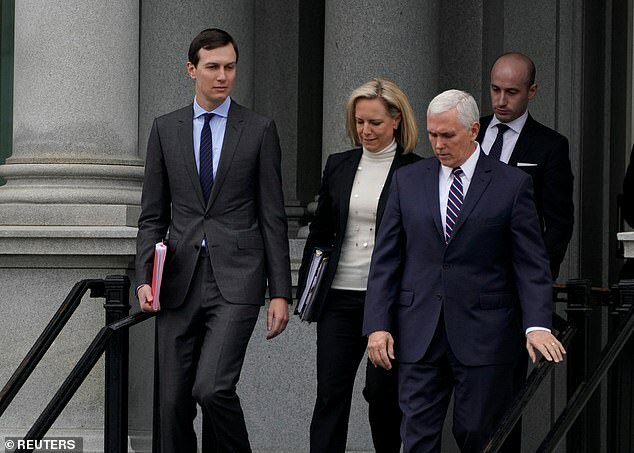 Trump has designated Vice President Mike Pence, Homeland Security Secretary Kirstjen Nielsen and advisors Stephen Miller and Jared Kushner to work with a congressional delegation at a meeting set for 11am on Saturday. ‘The Democrats want Billions of Dollars for Foreign Aid, but they don’t want to spend a small fraction of that number on properly securing our Border. Figure that one out!’ he continued. 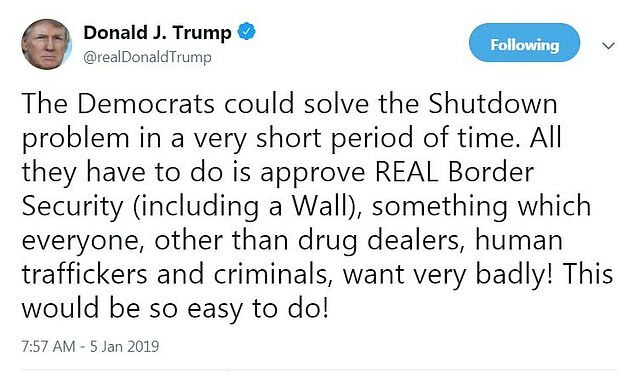 Earlier on Saturday, Trump said that Democrats could ‘solve the Shutdown problem in a very short period of time’, a day after threatening to declare a national emergency in order to build the wall without Congressional approval. 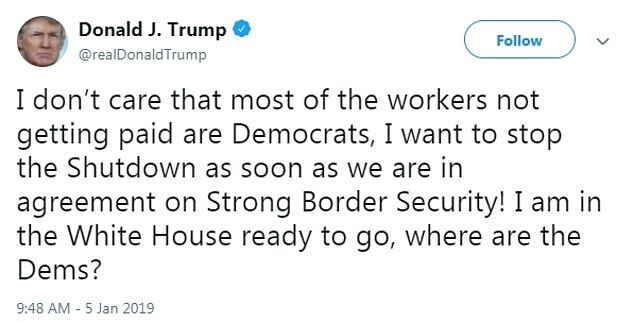 Trump is framing the upcoming weekend talks as progress, while Democrats are emphasizing families of government workers unable to pay bills. 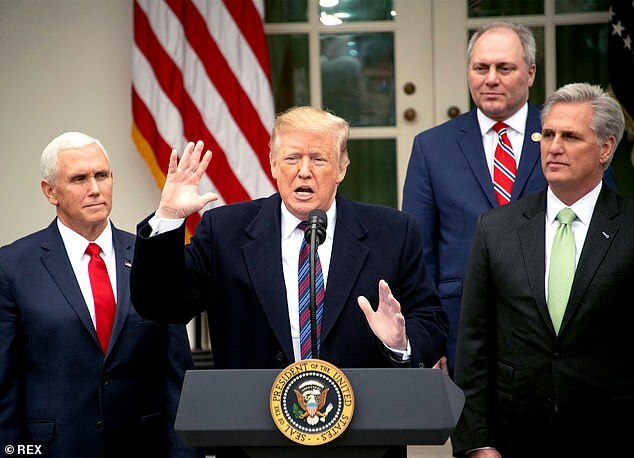 Trump also vowed on Friday that he will shut down the government for ‘months or even years’ if he does not get money for his border wall with Mexico. Trump’s threat was first disclosed by Chuck Schumer, the Senate minority leader, during a news conference outside the White House following a meeting between Congressional Democrats and the President. 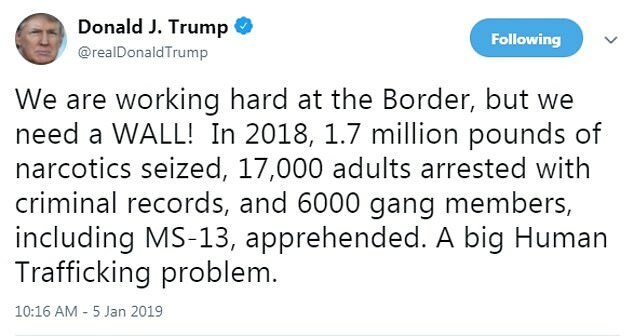 He accused the president of holding federal workers ‘hostage’ for the wall and urged him to continue the conversation with the government open.